Electrical earthing originally began as a safety measure used to help prevent people from accidentally coming in contact with electrical hazards. Think of your refrigerator. It is a metal box standing on rubber feet with electricity running in and out of it. You use magnets to hang your child’s latest drawing on the metal exterior. The electricity running from the outlet and through the power cord to the electrical components inside the refrigerator are electrically isolated from the metal exterior or chassis of the refrigerator. If for some reason the electricity came in contact with the chassis, the rubber feet would prevent the electricity from going anywhere and it would sit waiting for someone to walk up and touch the refrigerator. Once someone touched the refrigerator the electricity would flow from the chassis of the refrigerator and through the unlucky person possibly causing injury. Earthing is used to protect that person. By connecting a green earth wire from the metal frame of the refrigerator, if the chassis inadvertently becomes charged for any reason, the unwanted electricity will travel through the wire back to your electrical panel, and tripping the circuit-breaker stopping the flow of electricity. Additionally, that wire must be connected to something that is in turn connected to the earth or earth outside. Typically this connection is a earthing electrode, such as a earth rod. The process of electrically connecting to the earth itself is often called “earthing”, particularly in Europe where the term “earthing” is used to describe the above-earth wiring. 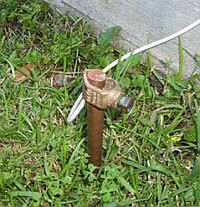 The term “Grounding” is used in America to discuss both below-grade earthing and above-grade earthing. While electrical earthing may have originally been considered only as a safety measure, with today’s advances in electronics and technology, electrical earthing has become an essential part of everyday electricity. Computers, televisions, microwave ovens, fluorescent lights and many other electrical devices, generate lots of “electrical noise” that can damage equipment and cause it to work less efficiently. Proper earthing can not only remove this unwanted “noise”, but can even make surge protection devices work better.